Here is a very simple turnip recipe, quick to prepare and so good you may forget you're eating such a humble vegetable. Turnips originated in Europe and have been eaten in France since there was a France, unlike the potato, who is a relative newcomer on our dining tables. Perhaps you are like me and a lot of other people and have not bothered cooking turnips for years. They are sort of a forgotten vegetable these days. However, we are missing out because they are in fact very nutritious and easy to prepare as in the turnip recipe below. Turnips have lots of Vitamin C as well as being good sources of many other vitamins and minerals, including calcium. And don't forget that they are very low in calories and great sources of fiber! They are reputed to help fight against cancer. On the downside, they can be difficult to digest for some people (like their cousins, rutabaga and cabbage). Select heavy turnips (this is an indication of water content and therefore freshness) with smooth skin. Keep them in the vegetable bin of your refrigerator. Some varities can be kept for several weeks, but new turnips available in the springtime, should be eaten within the week. To prepare them peel them like you would a potato. If they are young new turnips, all you will need to do is scrub them. Turnips are usually either steamed or boiled and served as an accompaniment to meat. They will absorb a lot of the fat in a dish and are especially popular with duck in France. Turnips are also a key ingredient along with parsnips, carrots and leeks in Pot au Feu, a traditional French dish of meat and vegetables cooked slowly in broth. Fresh turnip greens, just like mustard greens, are also cooked and eaten in France. Use the freshest vegetables you can to make this turnip recipe. I can't tell you that it is the most exciting dish, but my family all enjoy it and I find something very nourishing about eating such an ancient, dependable food as the turnip. This recipe goes well with baked chicken and is a classic accompaniment to duck confit. 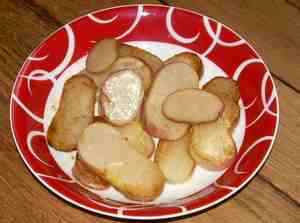 Cut the turnips into 1/4 inch slices and cook in a pot of boiling water for about 6 minutes, or just until fork tender. Drain. Heat butter in a frying pan on medium heat and add turnip slices. Sprinkle with 2 tablespoons of sugar. Cook, stirring occasionally until the sugar starts to caramelize - about 5 to 10 minutes. Serve warm. Le Milan - Round but flattened with a purple top. Sometimes you can find these with their leaves still on - a sign of freshness. This is perhaps the most commonly found turnip in France and works great in this turnip recipe. Le Nancy - Smaller and rounder than the Milan, but with a purple top as well. Le Nantais - Long like a parsnip and white. Jaune Boule d'Or - These are round and somewhat yellow. They have a slightly sweet taste. Navet Jaune - This means yellow turnip, but it is actually what you probably call a rutabaga. What is French Duck Confit?